Below you can find driving directions from Google Maps to help you get from Doral to your nearest Fix Apple Now store, situated in Weston. You can either copy the driving instructions below or click here for a larger map and driving directions. 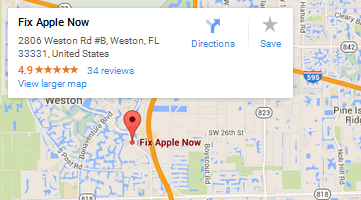 If you've been faced with a broken Apple device in Doral, get in touch with Fix Apple Now. We can help you fix, repair, restore, mend, replace or change your iPad, iPad Mini, Mac Mini, iPhone 4,5 or 6 or your iMac. Having been bringing Apple devices back to their former glory for years, we have the knowledge and experience needed to bring you the outstanding service you're looking for. Why not get in touch today if you need to fix a problem such as your Bluetooth not working, a cracked or frozen screen, an iPhone or iMac failing to charge, music apps crashing or your device not turning on or off at all? We want to help you bring your device back to life. We are the company to speak to if your Apple device has broken down and you need a quick solution. Talk to us today if you need to get a fix for your Apple in Doral quickly. Follow FL-821 N and I-75 N to FL-818 W/Griffin Rd in Davie.